Combination of avocado and tomato enhances the absorption of lycopene, the healthy component in a tomato. When you eat spinach, you’d better combine it with a piece of orange to improve iron absorption. This article will overview the winning healthy food combinations that help the body fight cancer, reduce cholesterol and prevent heart attacks. If you are looking for a winning formula to improve your quality of life, then use less medication and take advantage of what nature gives us. And here we come to an important concept: winning healthy food combinations. Each food individually has health benefits of its own, but when paired with another food item, you get a real winning match. Which food combinations should we make in our menu? The combination of tomato and avocado, for example in guacamole, allows the tomato lycopene to be better absorbed in the presence of the fat in avocados. Lycopene is used as an antioxidant and an essential material to prevent heart disease and blood vessels problems. In addition, the lycopene reduces the risk factors for cancer. Similarly, lycopene in tomato sauce is absorbed better if there is olive oil than if it’s oil-free dressing. If you don’t like olive oil, prepare a tomato salad with nuts and seeds that are high in quality fat. Recently it became clear that combining tomatoes and broccoli helps prevent thyroid tumors and reduce their size. This mechanism has not yet fully explained in terms of research, but this delicious combination improves coping with cancer cells. Surprising winning combination is a red apple and chocolate. Apples contain powerful anti-inflammatory substance called quercetin, especially in the skin and the parts close to it. This ingredient fights against allergic reaction, heart problems, Alzheimer’s, Parkinson’s disease, prostate cancer and lung cancer. Chocolate, as well as black grapes, berries and red wine, is rich in antioxidant called catechin that significantly reduces risk factors for atherosclerosis and cancer. Combining these foods reduces the adherence of blood platelets, enhances the activity of the cardiovascular system and prevents blood clotting disorders.Quercetin is also found in buckwheat, onions and berries, so you can build interesting food combinations such as sangria with sliced apples, bake of buckwheat filled with berries and more. Who has not combined together fish and garlic in one recipe or another? the recommendation to combine fish and fresh or cooked garlic is not mainly for taste reasons: this combination enhances the body’s ability to utilize anti-inflammatory components, reduce cholesterol levels in fish and utilize the essential fatty acid omega 3. The cholesterol-lowering effect is more powerful when eating these two foods together. Because fish are rich in vitamin D, another recommended food combination is salmon or tuna with soybean (Edamame) or other soy products. Soy is rich in flavonoid that increases the availability of vitamin D in the tissues. It is important to know that fish is in itself a perfect synergy between minerals such as zinc, iron, copper, iodine and selenium, that work together as a powerful anti-inflammatory component. Various berries such as blueberries, cranberries, currants and raspberries, combined with black grapes and a little bit of goji berry create dish that allows our body to utilize the most of the antioxidant action of these fruits, and to give us tremendous energy. The combination of vitamin C and iron is known to improve the absorption of iron in the cells. Therefore, it is recommended to combine foods rich in this vitamin, such as leafy greens, citrus fruits, tomatoes, strawberries, red pepper, melon and broccoli, with a plant-based foods rich in iron, such as spinach, kale, green beans, leeks and chard. When preparing a green salad it’s worth remembering to spice it with a little lemon and allow our immune system and our muscles get stronger. Roasting meat on fire exposes us to many dangerous substances and carcinogens. To reduce this exposure it’s better to roast the meat with rosemary sprigs. Rosemary contains antioxidants that reduce the amount of hazardous substances at high temperature by absorbing free radicals of the meat. Even a bowl of oatmeal and a glass full of fresh juice is recommended, and can be further upgraded with slices of orange or kiwifruit. The combination of oatmeal and vitamin C (orange juice or lemonade, kiwi, cantaloupe melon, strawberries, tomatoes or red peppers) reduces the values ​​of LDL (bad cholesterol), cleanse the blood vessels and helps prevent heart attacks, compared with consumption of each of the components separately. In conclusion, it is important to understand that combining certain foods may contribute more to our health and reduce damage caused by consumption of other foods. 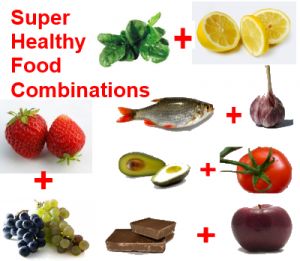 These winning combinations can fill us with energy and improve our mood and well-being.